If you hit the annual Illinois State Fair in Springfield this weekend, you'll see the usual attractions: livestock exhibits, a ferris wheel, puffy funnel cakes. You might also be surprised to find a small booth for one of the largest technology companies in the world. Google has long invested in projects to get kids interested in technology. Now, Google.org is giving the 4-H club a $1.5 million grant to help teach its 6 million members across the country about computer science. "We're helping bring awareness that [coding is] not just this image they have from TV -- a bunch of guys working alone in a room," said Jacqueline Fuller, president of Google.org, the company's philanthropic wing. The partnership, announced alongside the governor of Illinois at the state fair on Friday, has been in the works for over a year. But it is a timely example of Google contributing funds and resources to diversify the technology field. Earlier this week, the company found itself at the center of a fierce debate over diversity and sexism in technology. A Google employee was fired after writing a widely circulated memo claiming women are not biologically pre-dispositioned to work in technology. He claimed some of Google's efforts to increase diversity, such as programs available only to women and minorities, were discriminatory. The tech industry can use all the people it can get. There will be an estimated 1.4 million computer science jobs by 2020, but only 400,000 people will have the degrees to fill them, according to the U.S. Bureau of Labor Statistics. "We at Google have been thinking more and more about the future of work, the jobs are available now, and increasingly, the skills that are going to help kids and adults get those jobs," said Fuller. 4-H members in Oregon take part in a robotics club. Google.org chose 4-H due to its extensive reach and varied membership. The 114-year-old organization has an outdated reputation as a group for rural kids interested in agriculture. More than half of 4-H members are female and 35% are minorities. Participating kids now live in cities and suburbs as much as in rural areas or on farms. Fuller said Google also recognizes it's important to meet kids in the clubs and programs they're already a part of. "Our country needs computer scientists and 4-H has always been a part of developing leadership for the country," said Jennifer Sirangelo, ‎president of the national 4-H council. "Computer science and tech is not just transforming coastal cities; it's also really important in rural communities and in the agriculture and food sector." In addition to the 4-H grant, Google has helped create a custom computer science playbook for the club. It's also providing the organization with educational resources like Chromebooks and volunteers from Google (some of whom are 4-H alumni). In the first year, 4-H expects to bring the program to 100,000 kids in 22 states, before expanding across the country. The lessons are designed show kids how computer science relates to the topics and real world issues they're already interested in, whether its weather modeling for agriculture projects or using an e-textile application in 4-H sewing clubs. 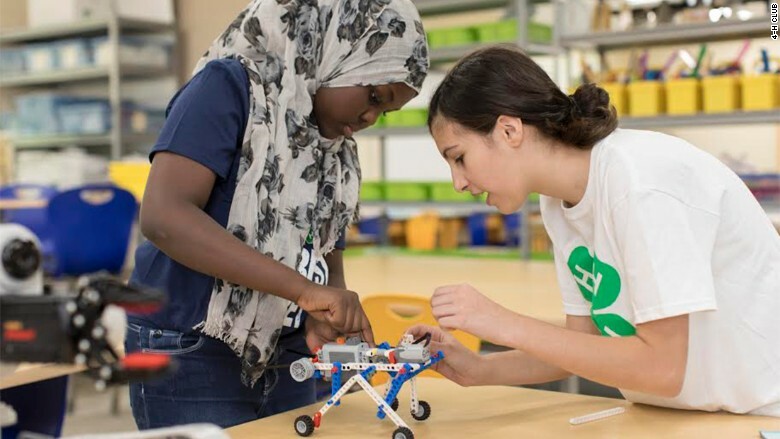 4-H had already added other STEM programs, like teaching kids to build robots, collect data with drones, and experiment with alternative energy. Fuller hopes the collaboration can help break some of the stereotypes about who should be interested in coding. "You're [not] only going to use this if you're a coder in San Francisco. These are core analytic skills that are going to help you with your passion," said Fuller.